Planctomyces limnophilus Hirsch and Müller 1986 belongs to the order Planctomycetales, which differs from other bacterial taxa by several distinctive features such as internal cell compartmentalization, multiplication by forming buds directly from the spherical, ovoid or pear-shaped mother cell and a cell wall which is stabilized by a proteinaceous layer rather than a peptidoglycan layer. Besides Pirellula staleyi, this is the second completed genome sequence of the family Planctomycetaceae. P. limnophilus is of interest because it differs from Pirellula by the presence of a stalk and its structure of fibril bundles, its cell shape and size, the formation of multicellular rosettes, low salt tolerance and red pigmented colonies. The 5,460,085 bp long genome with its 4,304 protein-coding and 66 RNA genes is a part of the Genomic Encyclopedia of Bacteria and Archaea project. Strain Mü 290T (= DSM 3776 = ATCC 43296) is the type strain of Planctomyces limnophilus . Currently, there are six species placed in the genus Planctomyces , the type species of which is P. bekefii [3–5]. The type species was initially described as a fungus under the International Code of Botanical Nomenclature [3,6]. The species P. guttaeformis and P. stranskae were also initially described as fungi, with their names being revived under the Bacteriological Code in 1984 . The genus name derives from the Greek words ‘planktos’, wandering, floating, and ‘mukês’ meaning ‘fungus’ to indicate a floating fungus , reflecting their initial descriptions as members of the fungi. The species epithet derives from the Greek words ‘limnos’, lake, and ‘philos’, friend, loving, to indicate lake-loving . Strain Mü 290T together with another strain (strain 279 = DSM 1115) have been isolated from the freshwater lake Plußsee in Holstein, Germany . Other strains of P. limnophilus have been isolated from Schrevenpark, Lake Mondsee, a ‘cattle manure’ (all near Kiel, Germany), and leakage water from a (industrial) compost heap (probably also in Germany) and were originally stored at the IFAM collection (Institut für Allgemeine Mikrobiologie, University of Kiel, Germany) . The rpoN gene from P. limnophilus has been used in complementation studies in order to demonstrate the range of phylogenetic groups within the domain Bacteria that are known to contain the alternative sigma factor σ54 . P. limnophilus strain Mü 290T has also been utilized to demonstrate the widespread presence of the dnaK (HSP70) multigene family in members of the orders Planctomycetales and Verrucomicrobiales . Quite early, in 1996, a physical map of the genome of strain Mü 290T had been obtained . P. limnophilus strain Mü 290T was also utilized in a comparative analysis of ribonuclease P RNA of the Planctomycetes . Here we present a summary classification and a set of features for P. limnophilus Mü 290T, together with the description of the complete genomic sequencing and annotation. This organism has a distinct cell cycle, with sessile mother cells forming stalks that attach to surfaces or to other stalks and motile daughter cells that bud from the mother cell. Mother cells are spherical to ovoid with stalks composed of twisted fibrils . The diameter of the mother cell is 1.1 to 1.5 µm. Multiplication occurs by budding on the distal cell pole, yielding daughter cells which are monotrichously and polarly flagellated . The carbon sources D-glucose, D-galactose, maltose, cellobiose, N-acetyl glucosamine are utilized (0.1% w/v) (Table 1), but not glucuronic acid, d-fructose, d-ribose, mannitol, starch, dextrin, inulin, salicin, pyruvate, citrate, α-oxoglutarate, succinate, fumarate, malate, formamide, methylamine·HCl (0.136%), formate (0.136%), urea (0.09%), methane (0.5%), methanol (0.4%), ethanol (0.4%), lactate, acetate, propionate, tartrate, glutarate, caproate, phtalate, glycerol (0.186%), l-arginine, l-aspartate, dl-alanine, l-glutamate, l-glycine, l-histidine, l-leucine, dl-phenylalanine, l-proline, and l-serine . There is no aerobic acid formation from d-glucose, saccharose, d-fructose, maltose, d-galactose and mannitol, nor is there anaerobic acid formation from d-fructose or mannitol. However, there is anaerobic acid formation from d-glucose, saccharose, maltose or galactose . Anaerobic gas formation on Hugh-Leifson medium was not reported. (NH4)2SO4 was utilized as a nitrogen source, but not NaNO2 (0.2 – 0.7%), NaNO3 (0.2 – 0.85%), methylamine·HCl (0.675%) or urea (0.46%) . Strain Mü 290T does not require vitamin supplements. It is reported to perform dissimilatory nitrate reduction, gelatin liquefaction, H2S formation and is tolerant to 30 vol% CO . However, strain Mü 290T is negative for decarboxylation of lysine or arginine, deamination of phenylalanine or lysine, oligocarbophilic growth, urease, nitrification, assimilatory nitrate reduction, anaerobic gas formation with nitrate, formation of acetoin (up to 27 d) or indole, growth in or changes of litmus milk, tolerance of 50 vol% CO, and extracellular DNase . As a member of the order Planctomycetales, P. limnophilus strain Mü 290T is characterized by several distinctive morphological features such as rigid stalk fibers and the formation of multicellular rosettes (Figure 1) . 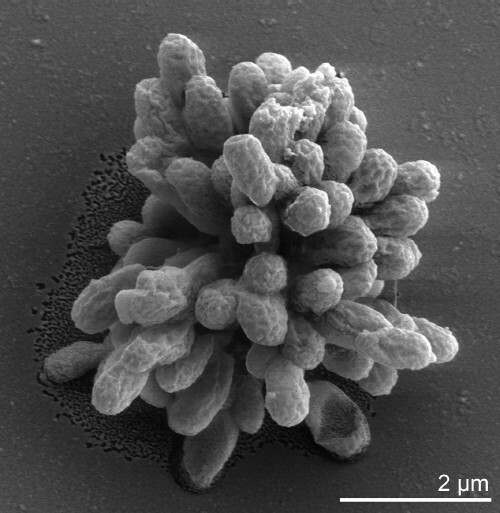 Further studies on another Planctomyces species, P. maris , revealed internal cell compartmentalization into the nucleoid, paryphoplasm, and a large ovoid central region . The 16S rRNA gene sequence similarity values among isolates of the currently described species of this genus are sufficiently divergent to consider a re-examination of their taxonomy, e.g. the sequences of the two other type strains in the genus, P. maris  and P. brasiliensis  each share only 84.9% sequence identity with strain Mü 290T [the other three species in this genus are currently without an available type strain], whereas the other type strains from the family Planctomycetaceae share 78.8 to 82.8% sequence identity with strain Mü 290T . This view is indirectly supported by the establishment of the genus Schlesneria, which is placed within the radiation of the genus Planctomyces  with up to 88.2% sequence identity with strain Mü 290T. Any taxonomic re-arrangements are linked to the absence of suitable biochemical/physiological, gene sequence and chemotaxonomic data for the type species of the genus and two additional species. 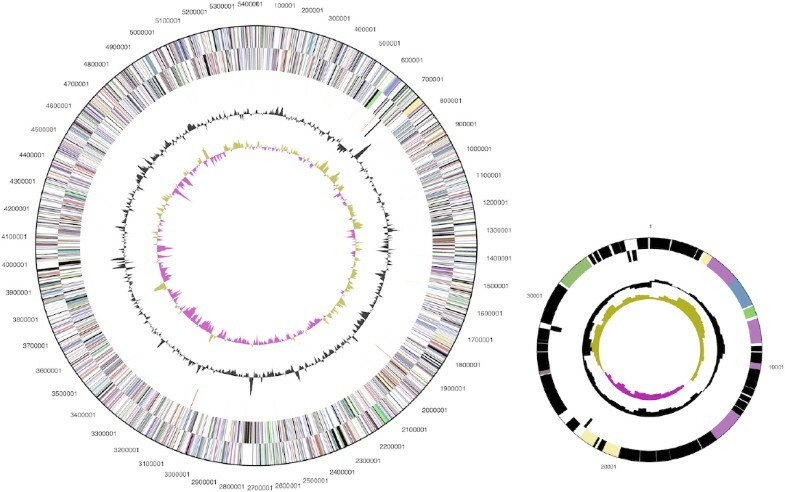 Uncultured clone sequences similar to the 16S rRNA gene sequence from P. limnophilus were obtained from earthworm gut (98%, FJ542967) , however, metagenomic surveys do not surpass 83% sequence similarity (status June 2010). Figure 2 shows the phylogenetic neighborhood of P. limnophilus Mü 290T in a 16S rRNA based tree. The sequences of the two identical 16S rRNA gene copies differ by one nucleotide from the previously published 16S rRNA sequence (X62911) generated from IFAM 1008, which contains one ambiguous base call. Phylogenetic tree highlighting the position of P. limnophilus Mü 290T relative to the type strains of the other species within the genus and to the type strains of the other genera within the family Planctomycetaceae. The tree was inferred from 1,336 aligned characters [27,28] of the 16S rRNA gene sequence under the maximum likelihood criterion  and rooted in accordance with the current taxonomy . The branches are scaled in terms of the expected number of substitutions per site. Numbers above branches are support values from 1,000 bootstrap replicates  if larger than 60%. Lineages with type strain genome sequencing projects registered in GOLD  are shown in blue, published genomes in bold, e.g. the recently published GEBA genome of Pirellula staleyi . 16S rRNA gene sequences are not available for strains of the species P. bekefii, P. guttaeformis or P. stranskae, all of which are typified by descriptions and were initially described as fungi [1,7]. The name P. gracilis was also initially described as a fungus, but the name has not been validly published under the Bacteriological Code. Starr et al. considered this organism not be to a planctomycete. The genus Planctomyces lacks muramic acid and diaminopimelic acid, as was determined for P. maris . However, a large amount of aspartic acid was found in whole cell hydrolysates . Instead of containing peptidoglycan, the 10% SDS resistant cell envelope consisted almost entirely of protein which is rich in proline and cysteine and is stabilized to a high degree by disulfide bonds . Comparable data are not available for P. limnophilus. The fatty acids in the polar lipids of strain Mü 290T are C16:0 (46.6%), C18:1ω9c (20.6%), C16:1ω7c (18.4%), C 18:1ω7c (5.5%), C 15:0 (1.0%), C 17:0 (1.7%), C 18:0 (1.0%), C 17:1ω8c (2.6), and C 20:1ω9c (1.3%) . A similar fatty acid composition was reported by Kulichevskaya et al. , who also reported the presence of long chain, saturated alcohols and diols. The dominant lipopolysaccharide hydroxy fatty acid of strain Mü 290T are C3-OH 14:0 (74.1%), C3-OH 20:0 (22.5%), and C3-OH 18:0 (3.4%) . The sole respiratory lipoquinone is MK-6, a feature of all members of the aerobic members of the family Planctomycetaceae examined to date . Like all members of Sittig and Schlesner’s group 3 Planctomycetes the type strain produced phosphatidylmonomethylethanolamine, phosphatidyldimethyl-ethanolamine, a glycolipid and smaller amounts of phosphatidylglycerol, phosphatidylcholine and bisphosphatidylglycerol . A survey on the cellular polyamine pattern of members of the order Planctomycetales revealed P. limnophilus strain Mü 290T to contain a large amount of putrescine and a relatively small amount of spermidine . P. limnophilus Mü 290T, DSM 3776, was grown in DSMZ medium 621 (PYGV medium)  at 28°C. DNA was isolated from 0.5–1 g of cell paste using Qiagen Genomic 500 DNA Kit (Qiagen, Hilden, Germany) following the standard protocol as recommended by the manufacturer, with doubled incubation time (1 hour) for cell lysis. The genome was sequenced using a combination of Sanger and 454 sequencing platforms. All general aspects of library construction and sequencing can be found at the JGI website (http://www.jgi.doe.gov/). Pyrosequencing reads were assembled using the Newbler assembler version 1.1.02.15 (Roche). Large Newbler contigs were broken into 6,078 overlapping fragments of 1,000 bp and entered into assembly as pseudo-reads. The sequences were assigned quality scores based on Newbler consensus q-scores with modifications to account for overlap redundancy and adjust inflated q-scores. A hybrid 454/Sanger assembly was made using the parallel phrap assembler (High Performance Software, LLC). Possible mis-assemblies were corrected and gaps between contigs were closed by editing in Consed, by custom primer walks from sub-clones or PCR products. A total of 18 Sanger finishing reads were produced to close gaps, to resolve repetitive regions, and to raise the quality of the finished sequence. Illumina reads were used to improve the final consensus quality using an in-house developed tool (the Polisher) . The error rate of the completed genome sequence is less than 1 in 100,000. Together, the combination of the Sanger and 454 sequencing platforms provided 23.9× coverage of the genome. The final assembly contains 43,393 Sanger reads and 544,012 pyrosequencing reads. The genome consists of a 5,460,075 bp long chromosome and a 37,010 bp long plasmid with a total G+C content of 53.7% (Table 3 and Figure 3). Of the 4,370 genes predicted, 4,304 were protein-coding genes, and 66 RNAs; 46 pseudogenes were also identified. The majority of the protein-coding genes (53.9%) were assigned a putative function while the remaining ones were annotated as hypothetical proteins. The distribution of genes into COGs functional categories is presented in Table 4. Graphical circular map of the chromosome and the plasmid (not drawn to scale). From outside to the center: Genes on forward strand (color by COG categories), Genes on reverse strand (color by COG categories), RNA genes (tRNAs green, rRNAs red, other RNAs black), GC content, GC skew. We would like to gratefully acknowledge the help of Helga Pomrenke (DSMZ) for growing cultures of P. limnophilus. This work was performed under the auspices of the US Department of Energy’s Office of Science, Biological and Environmental Research Program, and by the University of California, Lawrence Berkeley National Laboratory under contract No. DE-AC02-05CH11231, Lawrence Livermore National Laboratory under Contract No. DE-AC52-07NA27344, and Los Alamos National Laboratory under contract No. DE-AC02-06NA25396, UT-Battelle and Oak Ridge National Laboratory under contract DE-AC05-00OR22725, as well as German Research Foundation (DFG) INST 599/1-2 and SI 1352/1-2.